Leonard Nimoy connected with countless people over the past half-century. I think there is no finer example of a "friend" in popular fiction than Captain Kirk's right-hand man, Mr. Spock. And while Leonard Nimoy was a fantastic actor, he was most certainly not faking Spock's quality of character. To be precise, we loved Mr. Spock because of the man who played him. The friendships between its characters is what makes STAR TREK so enduring. How do we grow as a species? How do we overcome the limits of technology and achieve discoveries beyond our imagination? How do we survive in the face of all-surrounding danger? There are many factors that combine towards our heroes finding a way to succeed, but the one that matters most is that they didn't do it alone. 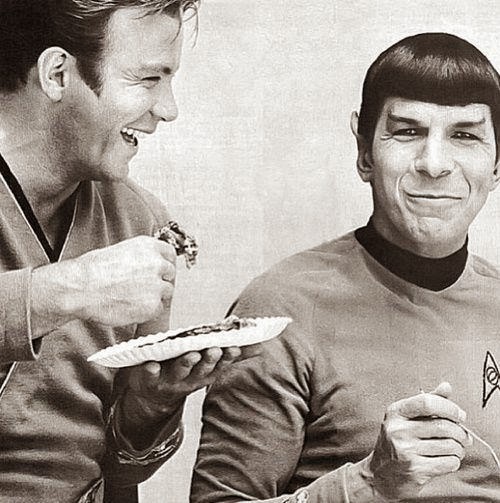 Leonard Nimoy was Spock and Spock was our friend. "A life is like a garden. Perfect moments can be had, but not preserved, except in memory. LLAP"
Rest in Peace, Leonard. You will live long in our hearts, and you will forever prosper. Truly a bummer. Well put, Adam.